Amateur Bodybuilder Of The Week: Raw Talent Reaps Big Results! Pro wrestlers blew Ali's mind as a child. He was fascinated about walking in their shoes and bodies. Ali never became a wrestler, but he did build the physique! As a child, I was fascinated by larger-than-life characters in pro wrestling with over-the-top personas that emitted strong confidence. People like Triple H, Stone Cold Steve Austin, The Rock, Chris Jericho, and Brock Lesnar. At age 16, my best friend introduced me to working out and told me it's what my childhood idols did to achieve huge physiques. I was addicted to the challenge instantly. The beginning stages of training were fascinating to see how much pain I could tolerate and how the mind played a role to overcome pain and reach higher. At age 16, a majority of people are still trying to become who they are, but I was certain that training would mold me into a stronger individual. For once in my life, I attained skills that would help me thrive, and become organized and disciplined. From there, I reevaluated my position and created a plan to better myself. I didn't want to get comfortable because comfort is an enemy of progression. Progression drives me to get better. It makes me reevaluate my position periodically and troubleshoot problems to find a proper solution. Progression makes me take steps to be prepared to work hard and smart. Bodybuilding molds you into a stronger person. Through hard work, you become consistent, determined, organized, and prepared. As a child, I grew up watching the hottest television show, WWE Monday Night Raw. My idols had a bold and confident presence and drive that led to them to the top of the business. These wrestlers became entrepreneurs and branched off into other successful careers. This motivated me because I knew bodybuilding would be a life-changing transformation mentally and physically. I kept current with wrestling and bodybuilding. I watched interviews, seminars, and in-depth training videos. It highly motivated me. My greatest inspirations are my parents and best friends who I consider brothers. They are the main reason I stand firmly on my own two feet. My parents are living proof that people who came from nothing can amount to something. My respect for them inspires and gives me the drive to create a ridiculous work ethic. 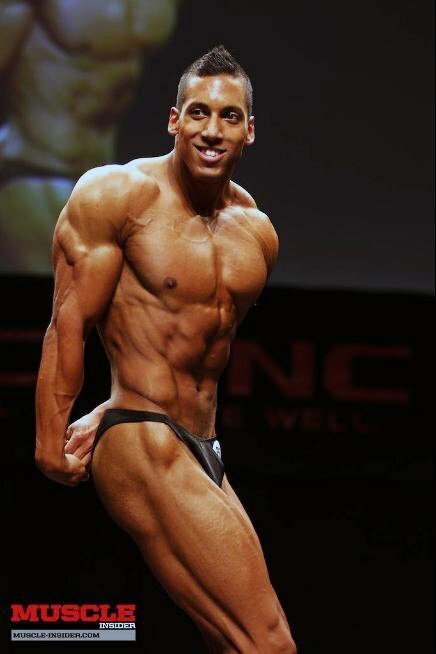 I competed in my first bodybuilding show on November 3, 2012, placed in the top five, and qualified for Toronto Provincials on June 1, 2013 or 2014. My plan is to have a productive off-season and a great contest preparation leading up to June 1, 2014. My long-term bodybuilding goal is to achieve a pro card before age 30. Kevin Levrone is my favorite bodybuilder. Be brought class to the stage. He had a classic physique, but was still large enough to hang with bodybuilding's top dogs. His posing was always phenomenal and complemented his music. His music had lots of meaning about his experiences. I have a lot of respect for his drive. It allowed me to connect with other members around the world who are involved in the lifestyle. Members always post motivational threads, which help everyone in this sport. Exercises on Bodybuilding.com and video clips show how to perform exercises properly.